Love is the right for who? Save Mehdi Kazemi – 1, originally uploaded by lewishamdreamer. 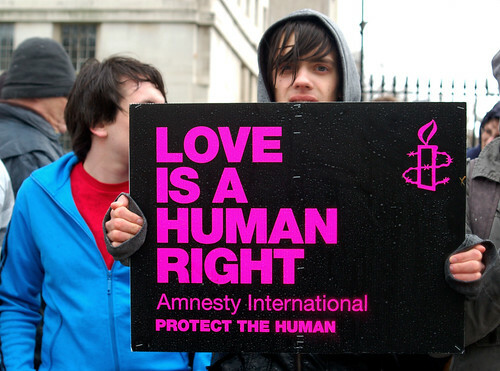 Who has the right to decide what kind of love is right and what kind of love is wrong? According to many religious leaders they have the right. Their law is The Bible or The Koran – two sacred books written in the spirit of loving and caring. “God hates fags” according to some loving and caring religious extremists – but God also created fags. What went wrong, and who has the right to change what God created? I still don’t get it. Fanaticism is about disabling your brain. Since 1989 when ayatollah Ali Khamenei took over power in Iran more than 4.000 gay and lesbians have been hanged in Iran. Is this love? To me he is just a plain murderer.